Domestic Demand component of GDP. So now, let's try to answer that persistent question: has Irish Economy regained pre-crisis peaks of economic activity? We need population figures to get the per-capita basis for the above metrics. We can compute all metrics in (1) based on actual CSO data. But we cannot know exactly our population size (CSO only provides estimates from 2011 through 2014 and no estimates for 2015). So I did a slightly cheeky approximation: I assumed that 2015 will see increase in Irish population of similar percentage as 2014. This is cheeky for two reasons: (1) population change can be slightly more or less than in 2014 due to natural reasons; and (2) emigration might be different in 2015 compared to 2014. Specifically, on the second matter, there has been some evidence of slower emigration out of Ireland and there have been some migrants coming into Ireland on foot of MNCs hiring. Irish Personal Consumption per capita (not shown in the chart above) on 12 months total through 1Q 2015 stood at around EUR19,074.79 or 8.4% lower than pre-crisis peak in 4Q 2007. 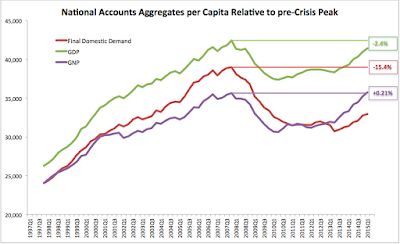 Meanwhile, Final Domestic Demand per capita was some 15.43% below pre-crisis average. Irish GDP per capita was around 2.4% lower than at pre-crisis peak. However, Irish GNP per capita in 1Q 2015 based on 12 months total was 0.2% above pre-crisis peak. 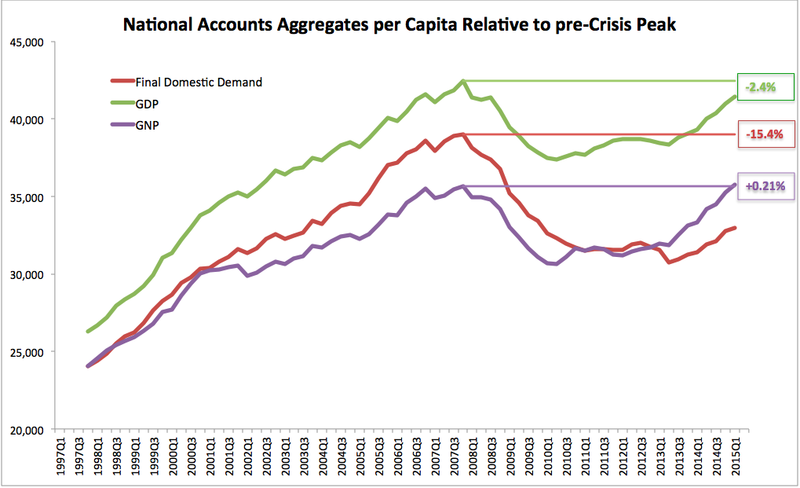 So in simple terms, by one metric of three, we are back at pre-crisis peak levels in per capita, inflation-adjusted terms. This metric is somewhat better than GDP per capita, but not perfect by any means and is getting worse, not better, in terms of measuring the real activity on the ground. Still, after 8 years, the recession cycle is complete in terms of GNP. It is still ongoing in terms of Domestic Demand.